MenuHome muscle cars for sale	-Muscle Car Parts -Muscle Car T-Shirts Best Muscle Cars	-Girls and Cars -AMC -Buick -Barn finds -Chevrolet -GM -Chrysler -Dodge -DeSoto -Ford -GMC -Hudson -Jensen -Mercury -Mopars -Oldsmobile -Plymouth -Pontiac -Shelby -Pro Street -Pro Touring -Resto Mod -Muscle Cars -Supercharged cars Readers Rides Video News	-Muscle Car Quiz! 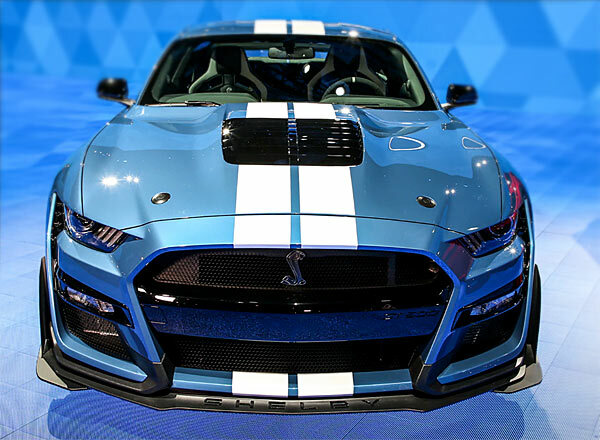 Ford have recently dropped a few more nuggets of information about the upcoming 2020 Mustang Shelby GT500, mostly about the aerodynamic features and track ready potential. The more eagle eyed out there have also spotted that the top speed has been limited to 180 mph on the new model, less than the Camaro ZL1 at 202 mph and 20 mph slower than the previous GT500. Clearly there are reasons, the main one being the new GT500 will be more track focused than before and to handle those corners effectively the overall top speed has been reduced. 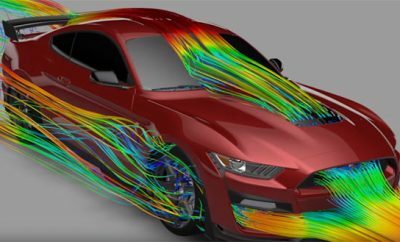 Ford’s press release for the GT500 goes into detail about supercomputers and 3D models have been used to test all areas of the car from airflow, cooling of the engine and brakes, along with the down force for all trim levels. The press release also talks extensively about downforce and ‘Keeping cool and precise on the track,’ clearly molding the image of the new GT500 as a track ready vehicle. Case in point with the optional Carbon Fiber Track Package which will produce 250kg of down force from a huge rear wing and the standard wing producing 172kg of down force at its top speed. The new fascia will also increase cooling capacity over 50% more than the current GT350. The new GT500 will pack a 5.2-liter supercharged V8, which is touted to be ‘delivering more than 700 horsepower’, compared to Chevy’s ZL1 6.2-liter supercharged LT4 with 650HP. 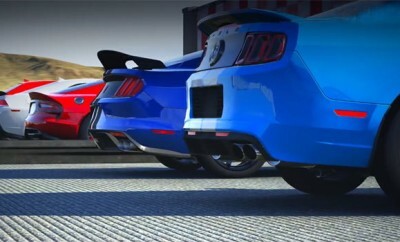 It will also be interesting to see if the 2020 GT500 can beat the Camaro ZL1 1LE round the Nurburgring which ran it in 7:16.04. It’s not that’s Ford have forgotten about straight-line speed, as they have quoted the new GT500 to be capable of a quarter-mile time of under 11 seconds. However, they are clearly shaping up the new GT500 to be ‘sports’ car as well as Pony/muscle car, taking the ZL1 head-on, along with a respectable straight-line speed. But it’s not just Chevy Ford have their eyes on. The current Mustang GT is selling well as an alternative to other high-end sports cars such as Porsche, so it makes sense they can hit the corners as good as anything else on the road. We spend a lot of time bringing you muscle car content. If you would like to donate something to help us keep going, that would be fantastic. 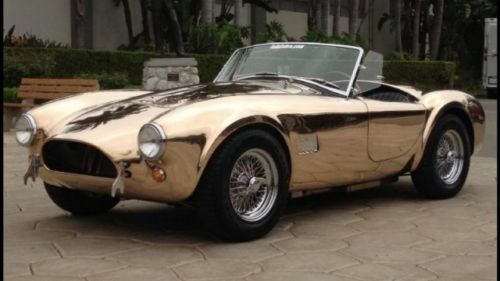 1966 Shelby Cobra Kirkham Convertible, 1 of 1. We will be selling the 2020 Shelby GT500 at MSRP with no additional markup. Check out all of our Performance and Specialty Vehicles at http://www.BrownLeeFord.com. Can you give fastmusclecar.com visitors any discounts…..,nudge, wink?!? Write For Us At Fast Muscle Car! Copyright © 2019. All rights reserved. Fastmusclecar is a participant in the Amazon Services LLC Associates Program, an affiliate advertising program designed to provide a means for sites to earn advertising fees by advertising and linking to amazon.com. Signup To Get The Latest Muscle Cars!